Former Arkansas Gov. Mike Huckabee met with House Republicans in D.C. on Wednesday and discussed the possibility of running for president again in 2016. Huckabee, who won the Iowa caucuses in 2012 and still has strong support from Evangelical voters in Iowa and South Carolina, received a “warm welcome” from 73 House members, according to a CNN report. “All options are on the table” for Huckabee, who reportedly stressed that Republicans should not nominate moderates like John McCain and Mitt Romney. Huckabee had trouble raising money to challenge McCain in 2008 and even mortgaged his home to stay in the race. Though he may face similar challenges should he run in 2016, Huckabee attended events at the RNC and for his PAC and reportedly indicated he thought raising money would be less of a problem for him for a potential 2016 run. 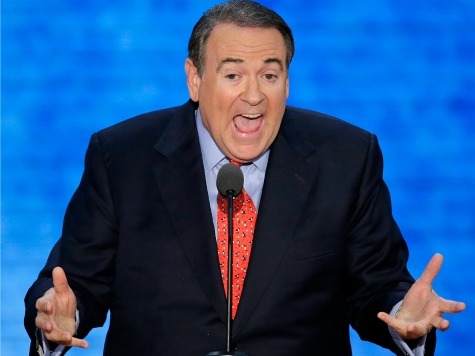 The potential 2016 GOP presidential field is the most split in 40 years, and Huckabee currently leads in the average of polls.